signed and on verso signed, titled and inscribed "13984" and "33410"
Marc-Aurèle Fortin was born in the peaceful Quebec town of Sainte-Rose and had a lifelong connection with this locale, often painting the surrounding countryside. 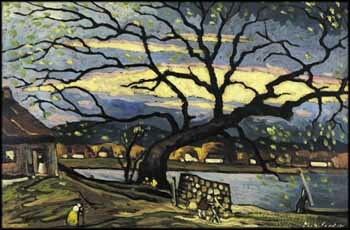 Fortin felt a great attraction to the venerable old trees there, and Richard Foisy writes that "they burst into the history of Quebec painting as if no other painter before Marc-Aurèle Fortin had ever looked at a tree and managed to depict it on a canvas with all of its foliage perpetually rustling, against a background of dazzling ever-present cloud effects." Here a towering tree spreads its twisting branches over the whole scene, its darkness dramatically highlighted against a stunning sunset. Adding to the strength of this painting, Fortin used a distinctive technique of laying down a black background, then applying chromatic planes of colour. This black underlay adds depth and an awareness of his painterly brushwork in the areas of lighter colour. Saturated with atmosphere, this striking painting of people’s activities at day's end in autumn captures the essence of rural Quebec. This work will be included in the forthcoming catalogue raisonné on the artist's work, #H-0182.